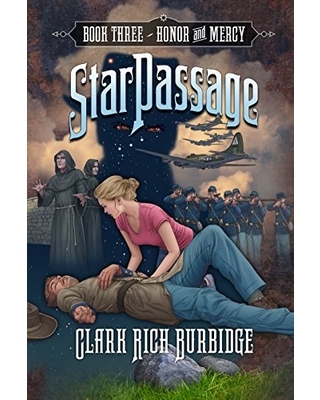 Award-winning storyteller, Clark R. Burbidge, brings the third book in this popular young adult paranormal, time travel adventure series to life in StarPassage Book 3: Honor & Mercy (June 21, Deep River Books), a non-stop spell-binder with surprises and suspense at every turn. Travel through history with the Carson family and their expanding group of friends as they struggle to understand the ancient relic’s purpose. Can they follow the clues and piece together the puzzle containing the answers they seek before being trapped forever by the evil forces that relentlessly pursue them? The StarPassage series required a ton of additional research. There is an entirely separate effort with each passage introduced. I want to get the details correct but recognize that there are times when some things are unknowable so I need to take a little literary license. Knowing when to do that is an art. For example I have ridden in a B-17 on four occasions. Each time was exhilarating as it taxied on the runway, began revving up and let loose the brakes for take-off. Sitting in the rough seats with only a seat belt seemed inadequate as we bounded down the runway. Then in the air flying through canyons below the tops of the mountains rising on either side viewing the countryside below. They allow you to move around to all the different stations. The narrow walkway through the bomb bay with bombs hanging on each side (unarmed ones) and crawling from the pilot’s cockpit down through the narrow cave-like passage to the nose where the navigator and bombardier sat was the most interesting. I sat out in the plexiglass bubble where the bomb site was still affixed to its post and looked down thousands of feet and imagined what it would have been like with flak bursting around having to concentrate feeling so exposed. Then it struck me. I was not alone. It felt like the small compartment was crowded with the spirits of those who had actually lived and too often died in this small space during times of conflict. It was a moving experience to sense some small part of their souls. Emotion overwhelmed me and tears ran down my cheeks as I felt these great souls trying to encourage me to tell part of their stories in a way that others living in freedom today would understand. “Help them to know that we did this for them,” I felt them say. “And never forget how dear life is.” It was a powerful and unexpected moment in that crowded space. It isn’t just the research you do in libraries or understanding the times and places one writes about. It is reaching across time and touching the souls who lived it, feeling the spirit of their lives, their emotions, fears and hopes. It is part of understanding why they did it and how they endured such unimaginable torment on a daily basis. I have also walked the Gettysburg battlefield on three separate occasions. I have stood more than once at the stone marking the end of the Union line on Little Round Top where Joshua Chamberlain’s 20th Maine stood with their line reversed against the furious charges of Oates’ Alabamians. I have crawled through the rock outcropping of Devil’s Den and climbed the hill from the Confederate’s point of view. Again as I stood on Little Round Top and at other places on the battlefield I felt, as many others have reported, the spirits of those long past who stood against incomprehensible ferocity of war with no possibility of retreat. Again I wondered how any human could bare the stress and fear and remain. Every person, young and old, should take the opportunity to stand where others stood and reach across the generations to touch them, understand their time and know the real meaning of freedom. Yes, one might say that to effectively write the StarPassage series with its time travel/paranormal theme that I had to engage in time travel/paranormal myself. And so I did. That is where my research took me, far beyond libraries and diaries. It took me through time and space to better understand in some small way the people of that time. Our young generation would be well served by reading the results of my research and then reaching out to understand as well. There is too much wasteful in-the-moment roller coaster riding that take them nowhere and protesting or resisting when they have little personal knowledge of that which they object to or of the real people who lived it. We are all better served by a little personal time travel.